A very small wizard name Inkydomus lives in the ruins of an abandoned castle. Because of a curse placed on his father, he has lived over three hundred years and has grown to a height of only twelve inches. His legendary adventures working for the royals are known throughout Europe. The stories have been passed down for generations among the royal and poor alike. Now after nearly a hundred years of hiding from a life he despised, he finds someone is searching for him. 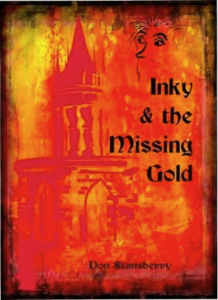 The though of an adventure is surprisingly appealing and Inky allows himself to be captured and taken to a king who needs a mystery solved. The adventure he finds is far more perilous than he ever expected. A cruel king, strange creature, a zoo full of monstrosities, and an unexpected friendship will change his life forever in the search for missing gold.